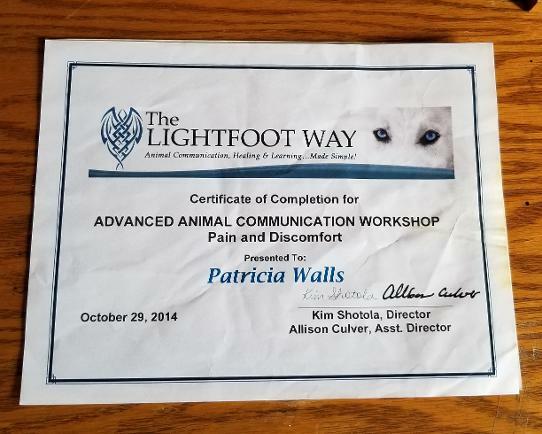 It is my job as an animal communicator and energist to treat each being as a respected individual and to relay those messages that they wish to get across to their human family as accurately as possible enabling both parties to become enlightened in the process, as well as honoring the wishes of the being in relation to healing and balance. To get to know their animals likes and dislikes. To find out the reason behind undesirable behavior and make the necessary adjustments to assist in resolving the disturbance. To inquire about how their body feels, where they are sore and use this information to give assistance. This information can also be used to assist your veterinarian. (Animal Communicators are never a replacement for good Veterinary care). To find out if they have a message for you. To find out if they like their food, living or sleeping arrangements, other animals in their environment, etc. To find out if your animal is ready or needs help passing on. Do you just want to “communicate” with your loved one or assist him/her to lead a healthier, happier life? These sessions are more than just finding out their likes, dislikes and issues. It is about assisting to resolve any disturbances. Have you ever wondered about some of the alternative healing modalities and if they can be used to enhance the well being of our furry, finned and winged friends? Many people in our society today are aware that energy healing can transform lives by releasing emotional wounds behind our physical manifestations and give not only relief of pain but in many cases complete and total healing of the physical body. That is because it is felt that all physical illnesses have an emotional root. If you successfully resolve the emotional imbalance, the body is able to heal itself. The pain relief benefits of energy healing have been well documented. At the minimum it releases endorphins in the body, which are nature’s own painkillers. Everyone/everything is energy. An energist influences energy systems deliberately and with intention, and that is regardless of whether the intention is to use one’s own energy system to make the required adjustments, or to channel universal energy through one’s own system instead. Energy flows where attention goes. I work with different energy healing and intuitive techniques for healing and empowerment. I have found these therapies to be a great help for many animal issues and problems, such as pain relief, trauma removal, allergies, eczema, behavior problems, training problems and/or relationship problems. There are always significant energy disturbances around these issues. The more we can clear away, the better we and the animal start to feel. They less fear and stress and this always helps the natural systems restore the balance in mind, body and spirit. This is beneficial for both for the animal and the human caretaker. It is hard when our animals are sick or suffering. We can often feel helpless on top of all the other feelings of sadness, anger and fear and stress. Using energy healing techniques we do something amazing, and something very real that helps deeply. Even if it doesn't cure the illness, it changes the "spirit of the situation" and that makes all the difference both to the animal as well as the guardian or caretaker. Why should those tools only be applied to human beings? Why should they not apply to animals? I know that they absolutely can and do work. The main difference between people and animals receiving energy healing sessions is just this: animals are wide open and receptive to allow in the most productive session possible. Animals naturally understand and respond to this non-invasive healing modality for what it is and what it does for them not just because they anticipate any benefits or because they feel safe and assured by the therapist. The response from the animals is the proof that energy healing works. Animals can suffer from physical problems just like we do, and living a human-created lifestyle can trigger many conditions, including emotional problems. Animals are natural empaths. An animals’ basic operating emotional system is one of love, compassion and nurturing. As such they are very sensitive to human moods and to atmospheres in the home environment. This complex soup of energies can be very unsettling for them and will affect their own emotional and mental state. Animals can suffer from stress just as much as humans do. In the wild some stress is necessary to enable the animal to learn how to survive, defend itself, find a mate or seek food. With captive or domesticated animals, stress due to a restricted or unnatural lifestyle, boredom, overcrowding, emotional changes, lack of exercise and stimulation, incorrect diet, over-breeding, grief, fear of humans or abuse leads to a very unhealthy and unhappy animal. Your animal companion may have suffered from some of these conditions before you got it, so it is good to give energy healing to help it let go of all the negative memories and to strengthen the immune system. Energy therapy doesn’t just target specific areas but the whole being of the animal. Treating the whole body at a deep level has a positive rollover effect everywhere and individual problems may resolve themselves…like negative behaviors and physical manifestations for example. The benefits are endless! !How Many Energy Sessions will Your Animal Companion Need? The number of treatments needed will depend on the condition(s) being treated, the age of the animal, and its response to the energy session. Chronic conditions will usually need more sessions than acute ones. If the problem is strictly emotion-based then maybe just one or two treatments, provided there are no other considerations. For therapeutic healing when the animal is healthy, a session every three to four months is normally adequate. Energy balancing and therapy is suitable for any animal and any condition. It is not a replacement for Veterinary care. Adoptive Issues - This activation clears the trauma and loneliness of being adopted. It clears the feelings of exclusion, anger and abandonment associated with being adopted or feeling orphaned. It connects them to unconditional love and the connection of their universal family. Animal Cruelty – Maybe your animal was treated really badly before coming to you. This deactivation is also for those animals raised for food. This deactivation is for releasing the cruelty that happens around the world to animals. Animal Kingdom – Activation to connect you to the animal kingdom so that you can better communicate with the animals. Not a clearing. Turns on crystal transmitters in DNA so that you can better communicate. Bodies in Balance – To balance the body, organs and chakras of your animals for healing. If your animal needs physical healing, this is a great activation. Breathe Peace - Release the sorrow and grief that is in the lungs. It clears it out from the Collective and from their genetics. This activation is good for any suffering from asthma, allergies or and disease or sickness related to the lungs…or anyone feeling the effect of sadness or grief. I find that I take bigger breaths when I do this activation. Cancer Free – This deactivation helps with those thoughts, feeling and emotions that trigger and promulgate cancer and from the need to take on the human family’s cancer. Diabetes – This deactivation releases them from diabetes? Live back in the sweetness of life–knowing life is wonderful, knowing it’s safe to enjoy themselves. Digestive System – Activation and deactivation to clean, clear and balance the digestive system. Disappointment Deactivation – Deactivation to release the disappointment from those that they count on; those humans or animal family who always let them down or fall short of expectations? Disconnect from Allergies- This deactivation clears any beliefs around allergies and the need to experience them. It clears any fears or subconscious beliefs around anything that triggers an allergic reaction. Disconnection from the FEAR of Lack, Fear of the Future and Scarcity – For those who are greedy eaters, which is usually a sign of the shock and trauma from lack, starvation and abuse. It releases all anger from all the cells of the body and closes off all neural pathways and receptors. It realigns them to wholeness on all levels, lifetimes and beyond, as well as aligns them with balance of giving and receiving. It clears all the shock, stress and trauma, the 3R's, all grudges, hatred, shame, any betrayal or abandonment from money, greed, all judgments, all negative free-floating memories, any hopelessness or despair by transmuting all of these to Pure Divine Unconditional Love. Disconnect from Slave Mentality- This activation clears the genetic, collective consciousness, and past lives trauma around slavery or being a slave or servant. It clears any blocks, oaths, and vows around slavery and allows them to live in your full creative power and freedom. Fears, Phobias, Anger, Resentment – Clearing the animals of any fears, phobias, anger or resentment. Free Your Genetics – This activation releases genetic patterns that do not serve them such as cancer, heart attack, blood disorders, etc. This activation will also replace genes with updated genes that are better for the DNA. Human Caretaker Issues – Animals are natural empaths and tend to take on the health and emotional issues of their caretakers. This deactivation is the release the animal from the need to take on the issues of their human family. I Am Worthy - This activation will remove those beliefs that keep animals from feeling worthy. Jealousy - This activation will help thrm release the means, desire, belief, or energy around jealousy. Karma – For releasing any karma you have with your animals from past live or this life even. Mother Mary - This activation encompasses them in the warmth, love and nurture of Mother Mary's energy. This activation assists with releasing old sorrows, sadness, loss and loneliness. Humans are often too busy to pay proper attention to their animals and so they feel neglected and act out. This activation gives them the love that they are craving. Not Enough – (channeled by Patricia Walls) – This is both an activation and deactivation for those that feel insignificant. For our animal companions who feel that they can never do enough to please anyone and will be enough for anyone. Playing it Small – This deactivation unplugs them from the need to play it small so others can feel comfortable around them. PTSD – This deactivation clears out all the traumas from past lives and this life time. There are many pets that are stuck in the emotions of traumas that have happened to them in their lives. In addition, this activation will allow them to release the memories of trauma that they experienced and are keeping them in the fear of reliving or attracting trauma into their lives, which is the root problem of many aggressive behaviors and attacks. Most of the time when animals are aggressive and attack it is because they are afraid for their lives. Release from Genetic Mutation – (channeled by Patricia Walls) – This activation is to release your animals from genetic mutations and heretic diseases. Wounded Heart – (channeled by Patricia Walls) Deactivation. This activation is for those that are stuck in that continuous place of poor pitiful me because of a past heart break. It releases them from the need to be “wounded” and feeling unloved, unappreciated and that no one will ever love them. Wonderful deactivation for shelter, homeless or zoo animals. To reserve a session, please click on the "appointment" link .